Opinion: Has Lance Armstrong's impact in cycling and beyond been a net positive? "Is it possible that Lance Armstrong's role in popularising cycling has done more for community cardiovascular health than 20 years of cardiovascular medicine?" Despite my views about doping, this question made me pause to think a bit deeper about what Lance Armstrong's wider impact has been. Beyond the costs of his doping to win those seven tainted Tour de France titles, and the other negative fallout from that, what were the positive effects from Lance Armstrong's cycling career? No doubt even the mere suggestion of this line of thinking will raise many people's hackles. Nevertheless, I feel it is an interesting question and discussion point, and worthy of some consideration. If you look to cycling history you'd have to conclude the chances are Armstrong will indeed be forgiven by cycling, and will probably be welcomed back in some way, or lauded as a hero in the future. There is something about the culture of cycling that continues to tolerate and celebrate past cheats and dopers. Evidence of this can be seen in the long list of past dopers and Tour de France riders who have either tested positive, confessed to doping, missed doping controls, or received sanctions; and yet have been forgiven or celebrated in the sport in some way. Consider the following names, and how they are regarded today: Jacques Ancquetil, Tom Simpson, Eddy Merckx, Laurent Fignon, Phil Anderson, Sean Kelly, Stephen Roche, Paul Kimmage, Stephen Hodge, Laurent Jalabert, Marco Pantani, Neil Stephens, Richard Virenque, Matt White, Stuart O'Grady, Jonathon Vaughters, Christian Vande Velde, David Millar, Erik Zabel, Michael Rasmussen, Alexander Vinokourov, George Hincapie, Alejandro Valverde, Alberto Contador, Ivan Basso, Ryder Hesjedal. So, what would we say if the analysis showed that Lance Armstrong's net impact in the world, his benefits minus his costs, has been mostly positive? How would we even begin to assess that? Now, I'm no health economist, mathematician, or advanced statistician. But the above equation does help to make an interesting point. Even without knowing the exact figures to plug into such an equation, I think it is reasonable to assume that the net impact of Lance Armstrong has been positive in dollar terms. Of course, these are just hypotheses. I could be wrong. And there's likely to be experts out there that would point to flaws in my basic equation above. I'd certainly welcome a discussion on this, and I'd love to see a health economist take on the challenge of calculating a valid and reliable 'Lance effect'. Methodological issues aside, as Lance Armstrong continues to make his presence felt, I still think the question of how we are to assess Armstrong's overall impact in cycling and beyond is worth contemplating now. He is not going away. Should we forget about Armstrong's positive impact? I appreciate many people won't be able to get past the cheating and other negative and destructive behaviour that Lance Armstrong exhibited during the peak of his Tour de France years. For better or worse, we often consider the positive contributions made by people with 'colourful' pasts and flawed characters when deciding when to punish and forgive. We are also often prone to a type of forgiveness and re-assessment of history following the deaths of people who have done good and bad – after which there is a public 'balancing' of their legacy (e.g. the reaction after the recent deaths of Alan Bond, Andrew Chan and Myuran Sukumaran shows this). I am not making a case for Lance Armstrong's forgiveness – Armstrong cheated the sport and cycling fans by doping, and the negative impact of that should not be forgotten, nor diluted by sentiment or time. Despite my strong opposition to doping in cycling, the answer to the question of what Armstrong's net impact has been doesn't look black and white to me. It's not as simple as saying Lance Armstrong is a bad person, so let's move on. To be honest, I would have no problem at all with deleting Lance Armstrong from the cycling history books. I'd be happy if he was never heard of again in cycling. But I also believe that if we're going to do that, to be consistent we should do the same with all the other dopers and cheats in this sport. Of course, that's not going to happen any time soon. So, we have no choice really but to reflect deeply and consistently about how we think of the dopers in cycling (all of them), their relative impact, and what is the right and fair thing to do about it. If cheating is 'normal' in cycling, how can we build integrity? It is ridiculous how people react when they hear of an athlete who has had a little help, through whatever means, to increase their performance. The fact is, nearly every athlete has used modern technology and medicine to increase their performance. It is not that big a deal, because on the field they are competing in, most other athletes do those things too, so the playing field is level. Did you know that Arnold Schw. and Sylvester Stallone both admitted to using steroids? Did you know you could use steroids for a short time and boost your strength, and then (gasp) stop doing them and keep the gains? What athlete wouldn't do that? Why make them out to be a cheat or a bad person? 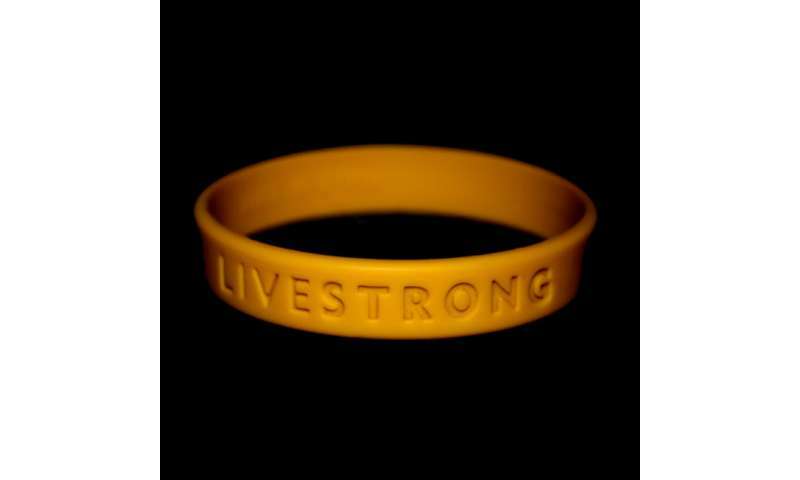 Think about all the work Lance Armstrong did to excel at the sport of cycling, and all that he went through. Did you see that list of other cyclists that were caught doping too? Like all of them? Yeah, its not a big deal. "Is it possible that Lance Armstrong's role in doping has done more to make the use of doping palatable to youths in gyms everywhere than all the drug dealers of the past 20 years?" The positive effect is only on people of the same nation (i.e. americans picking up cycling as a hobby) but the negative effects are on people of all nations ("See? Winners do (need) drugs!"). C5: Net future cost of having a doped (read: more aggressive/violence prone) youth and their health problems for decades to come. Doesn't look so hot for the 'positive influence' side from that perspective, now, does it? Face it, Humans are augments, we use technology to increase our performance. Gatorade, Creatine, Caffeine, Ibuprofen, Protein Drinks, High Altitude/Oxygen Chamber training, Lightweight Shoes, Moisture-wicking synthetic clothing, NOS-Booster, Testosterone Booster, Blood Cell Boosting/Blood Doping. Take Someone who trains hard and uses the items above, and take someone else who trains hard and doesn't use any of the above items. Who do you think would win? There is something about the culture of cycling that continues to tolerate and celebrate past cheats and dopers. Yep, because most are a bunch of self-aggrandizing, holier than thou, douchebags. Armstrong proved that enhancements work and are safe long term except for that cancer thing. I suggest that some foreign country somewhere host an Unlimited Olympics where doping and enhancements are allowed and encouraged. Let's see the true potential of the augmented human being. The best description of the Lance Armstrong saga comes from comedian Bill Burr when he was on Conan O'Brien. Youtube the bit. Hilariously accurate. 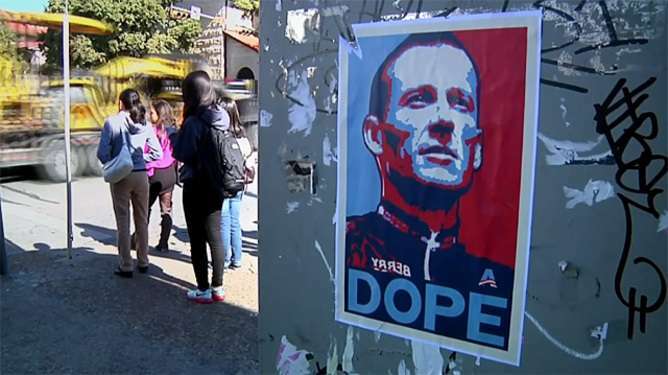 That poster of Lance Armstrong with the word DOPE is all wrong. In fact, its spelled back to front. So otto, would you signup your child or grandchild for this? No, that would be child endangerment wouldnt it? But when they reach adulthood they would be free to make their own decisions, as are lance and barry bonds and a-rod and schwarzenegger et al. And if they wanted to parkour or race formula 1 or base jump or spielunk then I might call them an idiot for doing it, but again it would be up to them, not me. Well, you gave me the answer I expected. Many Olympians are under 18. Are you suggesting that they do not deserve a fair chance because they are not old enough? Nobody cares about the Tour De' France. Nevertheless, what he did was cheating and it was right to revoke his titles and ban him. Still, it's a pretty well-known fact that most athletes in all of the major sports have been doping for years, baseball, football, olympic sprinters and other athletes, cyclists are just another category of cheaters. What's more, you pay/paid some of the cheaters in other sports as much as 20 million dollars per year to be the best at throwing a baseball or an air bladder. Professional athletes, in all sports, should not only have their titles revoked, but they should have to pay back their salaries and winnings if they are caught cheating.